Ferdinand Ries became a piano pupil of Beethoven, and also his copyist, around the beginning of 1803, by which time the master had published fourteen piano sonatas, the latest being the Moonlight. His progress was such that by mid-1804 he was the soloist in a performance of the third concerto and was permitted to write his own cadenzas. Around this time Ries wrote his first two piano sonatas. They were published in 1806 and dedicated to Beethoven. Unfortunately, the attachment was ended abruptly by his call-up for military service in 1805. The composition date of the Grande Sonate Op. 9 No. 1 does not seem to be known but the Grand Sonate Fantasie Op.26 was written in Paris in 1808. Both were published a couple of years after that. All the music on this disc predates the composition of Beethoven�s late great sonatas from Les Adieux onwards. For more information about Ries follow the link below. The Grande Sonate Op.9 No. 1 is in three movements with an opening Allegro, central minuet and concluding theme with eight variations. The work opens playfully and could easily be mistaken for early Beethoven. In the second movement the mood is darker and expression more personal. The theme of the finale is rather trivial but the variations are much more inventive although tonally unambitious. The Grande Sonate Fantaisie is a significant advance and perhaps modelled on the Path�tique. It opens with a portentous slow introduction followed by a very restless Allegro. The subsequent Andante is brief and songful, leading directly into a finale which lasts over 13 minutes. Epic and full of Beethovenian drama, this is the most impressive part of the disc and would seem to have been the obvious place to close. The inclusion of the slow movements of the two Op.5 sonatinas as fillers is the one black mark. It is not that they are uninteresting but surely, in the twenty-seven spare minutes, there would have been room for at least one if not both of these works complete. As it is, they are hardly an ideal postlude to a major work and would have been better placed between the sonatas. Alexandra Oehler is a young German pianist who seems to be in her element in this music. She circumvents the technical difficulties with ease and achieves a pleasing sound aided by a decent recording. There is extensive documentation that is slightly rambling in places and lacks information on Ries�s other piano sonatas. This may reflect current uncertainty on the matter. 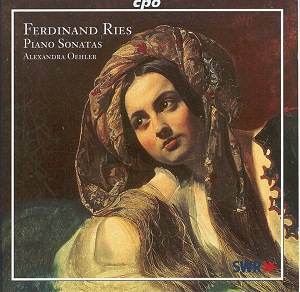 Ries was a prolific composer but I have not been able to find out how many piano sonatas he wrote. Nor could I find evidence of other currently available recordings of his piano sonatas. If, like me, you prize a set of Beethoven�s 32 as among the most essential discs, you will certainly enjoy this one as a supplement. Felicitations to CPO and Ms. Oehler. More please.